Grilled Chicken Harvest Salad is a meal in a bowl that’s fresh, healthy and delicious! Today I want to share an incredibly delicious salad recipe with you, but first, I want to introduce you to an incredible new cookbook, Perfect Flavors. No, I didn’t write it (the uber talented Naomi Nachman did that!) but I was the photographer for it, and was able to get a really close look at the process, as well as taste most of the delicious foods in this book. 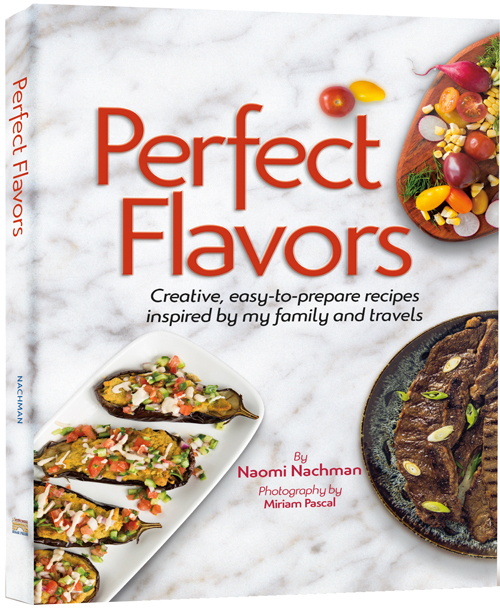 When Naomi started working on Perfect Flavors, she wanted to include an assortment of family-friendly dishes, creative recipes, and food from her travels all over the world. And let me tell you guys, she seriously delivered! In the travel inspired category, there are chicken spring rolls from her trip to Thailand, Brisket Fries inspired by a restaurant meal in Memphis Tennessee, and Falafel Stuffed Eggplant inspired by her love of Israel. In the creative category, Naomi pulled together some crazy awesome ideas like Turducken Capons (a play on the famous Thanksgiving recipe where you stuff a chicken capon with turkey and wrap it in duck fry!) and Quizza – where the flavors of pizza are presented in quiche form. And in the family-friendly category, you’ll find your new staple dishes, like Everything Buns (the ultimate savory twist on cinnamon buns), Ginger Soy Steak Salad (that skirt steak is everything!! ), Flanken Onion Soup (made in a crockpot so it’s super easy), Sweet Chili Salmon (perfect dish for shabbos lunch), and so, so much more. Some of my personal favorite dishes in Perfect Flavors include Salad Topped Salami Pizza, Red Lentil Vegetable Soup, Sesame Panko Chicken, Roasted Eggplant Parmesan, Drunken Orange Brownies, Avocado Chickpea Salad, Beer Glazed Wings, and this salad – one of my new favorites – Grilled Chicken Harvest Salad! It’s a meal in a bowl that’s great for a lunch on the go, shabbos lunch, or a healthy meal anytime. You can skip the grilled chicken for a filling parve salad, or you can skip the salad and just enjoy delicious grilled chicken. Either way, I know you’re all going to enjoy this recipe, just like I know you’re going to love Perfect Flavors. Place chicken, olive oil, maple syrup, balsamic vinegar, salt, and garlic into a large bowl. Stir to coat chicken. Cover; marinate in the fridge for at least 1 hour, up to overnight. After chicken has marinated, heat canola oil over medium heat in a large frying pan or grill pan. Remove chicken from marinade; discard marinade remaining in bowl. Grill chicken strips for a few minutes per side, until browned and cooked through. Remove chicken from pan; set aside to cool. Place all dressing ingredients into a small bowl. Whisk to combine. Place lettuce into a large bowl. Top with pear, quinoa, almonds, and dried cherries. Place grilled chicken over salad. Add dressing; toss to combine. Recipe from Perfect Flavors by Naomi Nachman, reproduced with permission from the copyright holders, ArtScroll/Mesorah Publications. I live in Israel and I made the pull apart appetizer pie- mini deli rolls and franks in the blanks.. etc..
when we got to the middle rolls – the pastry dough wasn’t baked .. I kept it in the oven over an hour and 20 min on the appropriate temp. It was so good and def a dish I want to make again!